Job, family, friends – our everyday lives lay claim to a lot of our time. It’s hard enough already to fit everything in and spend enough time with everyone. And when it comes to cleaning, we rarely feel particularly motivated. But why cause yourself more stress than you already have? Why don’t you make your life a little bit easier by looking for a cleaner to take care of the unpleasant job of cleaning your apartment? You can book your personal cleaner online with us to come to your apartment at your preferred interval and take the pesky housework off of your hands. We’d be happy to accommodate you with the selection of your new cleaner. You always want the same person to come to your home? Your cleaner should speak English, be good with children and / or pets? Just enter your requirements when you book, and we’ll find the right cleaning personnel for you. 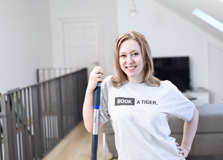 Why cleaners from BOOK A TIGER? There are quite a few cleaning services these days, including on the Internet. And of course you can always find willing cleaning personnel on the black market. But the differences are considerable and cleaners aren’t all the same. There are a number of reasons why our service has the most advantages over other service providers. 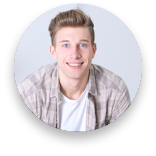 Whether you use black market or freelancers working for various online cleaning service providers – when you hire a cleaner, you usually have no idea about their ability and quality. Nor do you know if they’re reliable. That can cause the process to drag on and be a real strain on your nerves. Will the cleaner even show up when you agreed, will the result be satisfactory? With us, these uncertainties are a thing of the past. We thoroughly vet the cleaners that we send to your home. Both in personal interviews and a trial cleaning, the applicants have to convince us of their motivation and skills. Of course, anyone can claim that. But we also employ our staff and pay them a full salary. It goes without saying that we wouldn’t pay anyone regular wages unless we could place our full trust in them. By providing steady employment, we ensure that all our employees share our – and most of all your – understanding of quality. If you book a cleaner with us, you can be sure they’re motivated, trained and insured. And if your personal cleaner is ever on holiday or ill, you won’t be stood up. Of course we’ll make sure to provide an adequate replacement. I thought your email reminder service was superb and very reliable. The cleaning was carried out to my fullest satisfaction. I’ll be glad to use your service again. I’m sure to recommend BOOK A TIGER and can finally focus on more important tasks. Stop exhausting yourself with housework or getting frustrated with unreliable cleaning personnel. With us, you’re just a click away from your reliable, friendly and personal cleaner. Security, reliability and quality are central to us. So you can lay back, relax and enjoy your free time. What can you expect from your new cleaner? As a rule, a cleaning by one of our employees follows a strict system. The first step is tidying up. Then all surfaces are freed from dust and dirt, the floors are wiped and vacuumed. The bathroom and the kitchen are thoroughly cleaned, dirty dishes are washed up, all the rooms are aired out and the rubbish is brought out. The 4-colour system is strictly applied, according to which a different cloth is used for each area in the apartment to stop germs from spreading. Do you require other cleaning services, e.g. would you like the inside of the fridge to be cleaned or is there something you want ironed? Then just tell us when you place your next order or talk to your cleaner, and we’d be pleased to take care of that, too. Our employees aren’t just reliable and fully tested. They also have liability insurance. If any damage should occur during a cleaning, we ensure that you are compensated quickly and hassle-free. Our partner, Ergo Versicherung AG, covers damages of up to a value of €3,000,000. Just submit a damage report, and we’ll take care of the rest. You can reach our customer service by phone or via email. By the way: as our employees are legally employed, of course we also issue tax-compliant invoices. You can submit them the next time you declare your taxes and get back up to 20 percent of the costs incurred. You can manage our entire service online. You want to book a cleaning appointment, cancel a pre-booked appointment or reschedule? Then just log in to the personal area and manage your appointments to suit your needs. You can also view and download your invoices at any time from here. Would you like to arrange something with your cleaner for the next appointment? Then our Tiger Chat is the right app for you. With our tools, you can access everything you need and can manage and organise your appointments wherever you are. Just use them through your PC or via our smartphone app.